The County Fire burning in Yolo County has consumed at least 90,288 acres, the size of San Francisco, Daly City, San Bruno and San Mateo combined. It is 80 percent contained, according to Cal Fire. GUINDA, Calif. (KGO) -- The County Fire burning in Yolo County has consumed at least 90,288 acres, the size of San Francisco, Daly City, San Bruno and San Mateo combined. It is 89 percent contained, according to Cal Fire.. Here's the latest on the fast-moving fire. Evacuations are mandatory in the area and officials are working to contain the blaze. 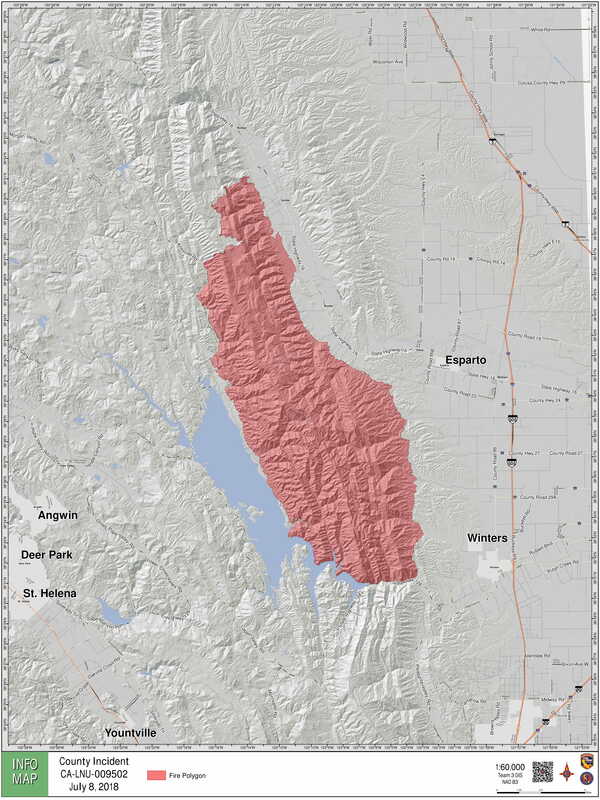 Cal Fire released a map showing the area affected by the flames. 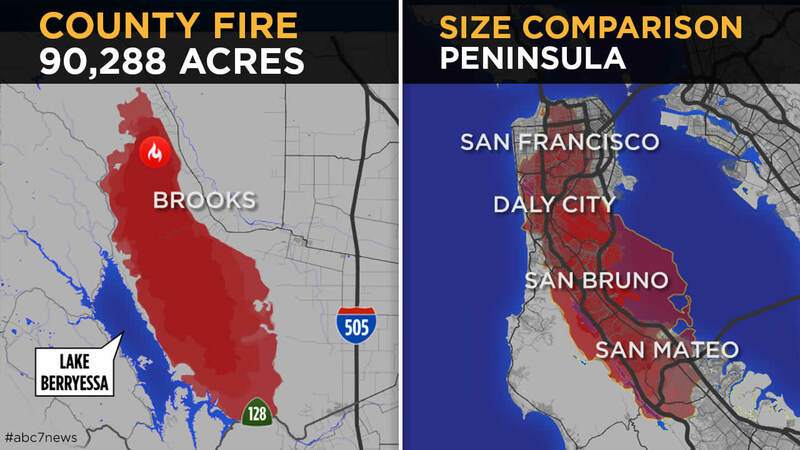 This image shows a size comparison if the massive wildfire was burning along the Peninsula. The fire is burning 50 miles northwest of Sacramento and has forced mandatory evacuations in the area. Some are still in effect but officials have lifted the orders along the eastern shore of Lake Berryessa, east to the Napa/Yolo County Line, north of State Highway 128, and South of the intersection of East Side Road and Knoxville Berryessa Road. The lifted evacuations includes residences served by East Side Road, South of Knoxville Berryessa Road. More than 10 active fires are burning in California. Click here for the latest information from Cal Fire on the County Fire. Get the latest on all the wildfires burning here in the Bay Area and across the state here.